New York is a monumental, awe-inspiring city. Much of its gritty cinematographic character comes from her heavy makeup, layers upon layers of pollution deposited for decades in every nook and crack. 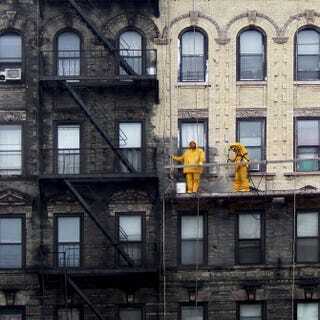 Trevor Little's photo of two guys powerwashing a building clearly shows this beautiful old whore's true skin. Going through Trevor's gallery makes Bobby Short's I Happen to Like New York live at the Carlyle play in my head.